Linear bearings comprise of two types of bearings which are linear way bearings and linear bushing bearings. The only difference between the two is that linear bushing bearings use a round shaft while linear way bearings use a rectangular shaped track. Linear bearings contain several rows of recirculating balls or rollers which allow them to run smoothly in a linear motion. All of our linear bearings are factory pre-lubricated and will not need future lubrication to keep them running smoothly. With a wide range of linear bearings available from top manufacturers, at Hunt Bearings we can provide you with a solution that is right for your industry. Linear bearings are used for a wide range of linear application and linear guidance tasks and provide a low friction, high precision and reliable movement. From standard to compact our range of linear bushing bearings are suitable for a wide range of applications and environmental conditions. Different materials are available to provide increased corrosion resistance and the lubricant ensures a long service lifetime. 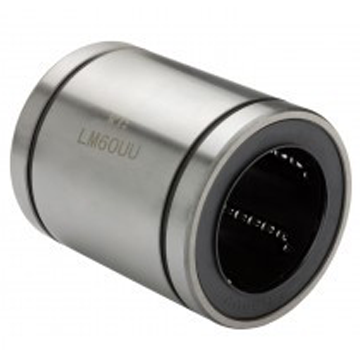 No matter what your bearing needs at Hunt Bearings we will be happy to help you find the perfect solution. Get your free quote today by giving us a call on 01256 761067.